#5 (catch up) Cary Stevens is my Great Grandfather on my father’s side. He was born 1 February 1870 in Acton, Indiana to George W. Stevens and Sarah J. Foglesong. The story gets interesting when he marries Minnie Blanche Shipp in 1888. He joined the Army, swearing he is single, in 1899 and was sent to the Philippines to fight in the Spanish American War. He hadn’t been there long when Minnie Blanche petitioned the Army to let him out because she was pregnant. The Army let him out and he is listed in the 1900 census twice, once in the Philippines with the Army and then again in Indiana living with Minnie Blanche and their son, Henry Burl in the house of her father, William Henry Shipp. I can only imagine the tension in that household! By 1904, Cary has married Gertrude Lindburg Mock who, in 1900, had been living with her husband and daughter just five dwellings away from Cary and Minnie Blanche. I know that Gertrude was widowed by that time. I’m assuming Cary and Minnie Blanche divorced but I have yet to find proof. Cary went on to have a daughter with Gertrude, they moved to California with the two girls and lived a very happy life out there. Minnie Blanche remarried but I have no evidence of that yet either except that we always knew her as Grama Moore. 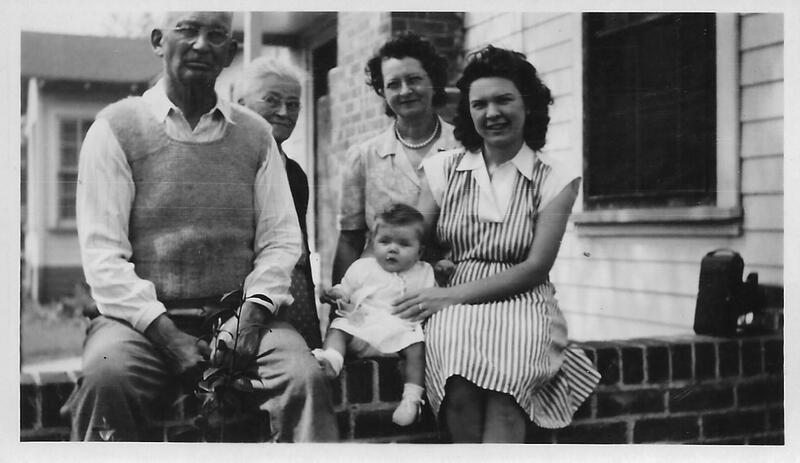 Cary Stevens with Gertrude, their daughter Joanna, my mother Sylvia Marie Tennant Stevens and sister, Barbara Marie Stevens. This entry was posted in Stevens and tagged Cary Stevens, George W. Stevens, Gertrude Lindburg Mock, Minnie Blanche Shipp, Sarah J. Foglesong, Spanish–American War, the Philippines, William Henry Shipp. Bookmark the permalink. Mrs. Sarah Jane (Hutchinson) Stevens, ninety-six, believed to be Greenwood’s oldest citizen, passed away Tuesday afternoon and funeral services were from the Baptist Church Thursday afternoon at 2 o’clock. The Rev. H.C. Clippinger officiated and interment was made in the Greenwood Cemetery. Her death ended an illness which had extended over a period of several years, the last two or three of which she was confined to her bed. Her condition had been serious for several weeks and relatives had been called to her bedside. Although Mrs. Stevens had been confined to her bed for the past two years, she retained her mental faculties and her interest in present day affairs. Although quite deaf and almost blind, her mind was keen and her memory quite good. She was able to recall vividly happenings of many years ago. Rounding out almost a century of life, Mrs. Stevens had known hardships of the pioneer, the tragedy of war, and felt the pangs of poverty as only those of her generation could know. Her parents David and Mary Hutchinson, were pioneer settlers of eastern Indiana, but from time of her marriage to George Stevens in the late fifties, she had been a resident of this community. They resided on a farm east of Greenwood until Mr. Stevens retired from active work forty years ago and since that time a daughter, Mrs. Thomas Paxton has resided with and cared for her. Leaving Mrs. Stevens and two small children to go off and serve his country, Mr. Stevens enlisted in the Union Army and served four years, and eight months, during the Civil War. During his absence Mrs. Stevens remained on the farm part of the time and the rest lived with her parents, but the pangs of the war were still vivid in her as she recalled the anxiety through which she passed during those long months of waiting for his return. Mr. and Mrs. Stevens reared a family of ten children, all of whom lived to maturity. Five daughters and three sons, together with twenty-five grandchildren, fifty-two great grandchildren and one great-great grandchild, survive. The children are Mrs. Emma Swails of Acton; Mrs. Clara Brann, Mrs. Ida Paxton, Greenwood; Mrs. Pearl VanArsdale, Indianapolis; Mrs. Ella Forsythe, Frankfort; Gus Stevens, Acton, Cary Stevens, California, and Will Stevens of Charleston, South Carolina. A daughter, Mrs. Emma Berry, died at the age of sixty-five, and one son, George passed away when he was thirty-five. Mrs. Stevens was a member of the Baptist Church and as long as her health would permit, was active in the services of the church.